Our tour group boarded our bus outside our hotel in Jerusalem and traveled 20 minutes to the city of Bethlehem, home of 25,000 people. We drove past the huge cement wall built between Palestinian controlled Bethlehem and Jerusalem to prevent the Arab snipers from shooting them. At the checkpoint, the security guard waved us through after our driver told him we were American tourists. 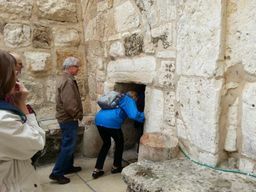 We parked in an underground garage and walked several blocks uphill to the Church of the Nativity, the traditional site where Jesus Christ was born in a cave. We passed Muslim women dressed head to toe in black, brown, or gray burkas. 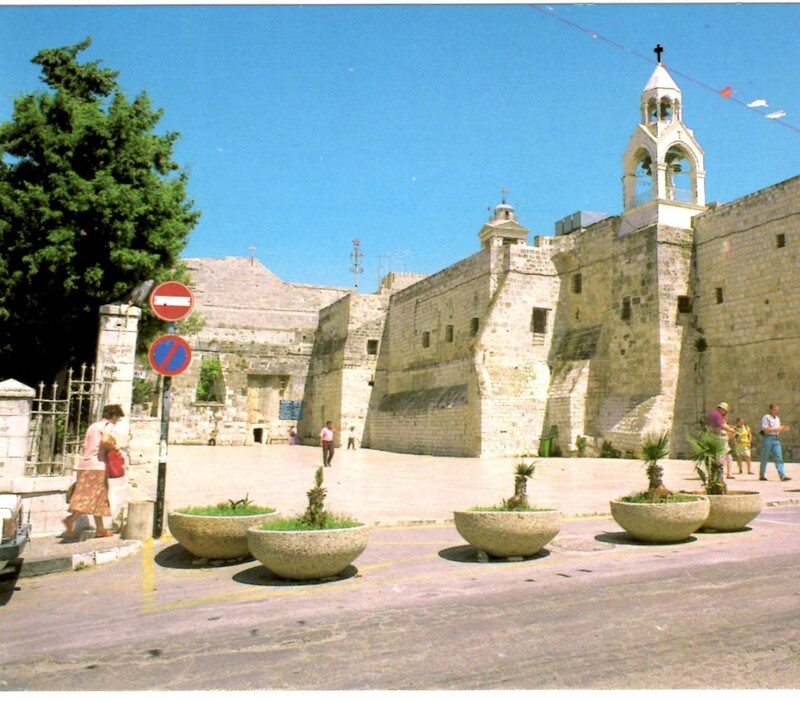 Construction began in 326 A.D. on this oldest church in the Holy Land still in use. Three different congregations of the Franciscan Catholics, Greek Orthodox, and Armenian Orthodox have each built their own sanctuary within the walls. We crouched to crawl through a tiny entrance while stepping over the high threshold. Our guide explained they built it this short purposely to deter any intruders. When an enemy entered bent over, he couldn’t shoot anyone, but the person inside could knock him over or easily kill him. We wandered from one sanctuary to the other comparing the different architectural styles, noticing the Armenian one was the most ornate. 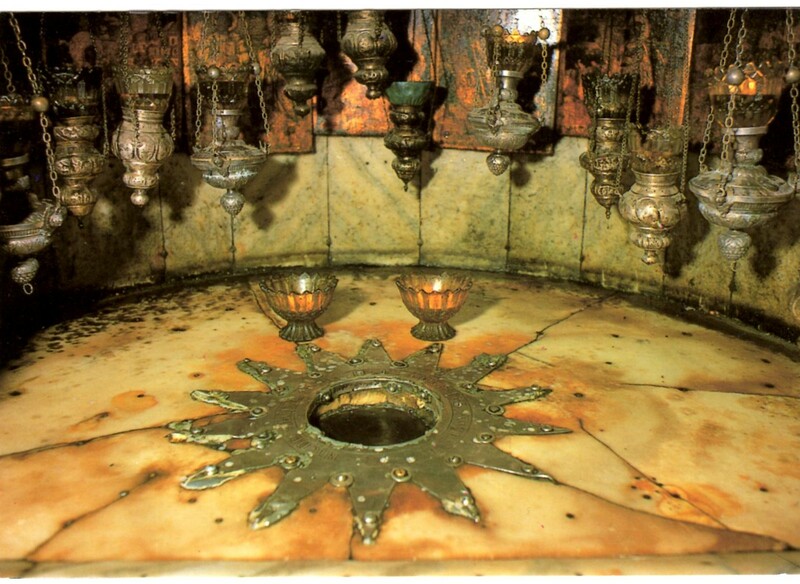 We waited in line and finally saw the glass-covered hole in the floor, the traditional birthplace of Christ. When the State of Israel began in 1948, Christians resided in Bethlehem, but now only a few dozen Christian families remain. The Muslims won’t hire them, so all the Christian young people are leaving. We visited a gift shop an Arab Christian started to support the remaining families. 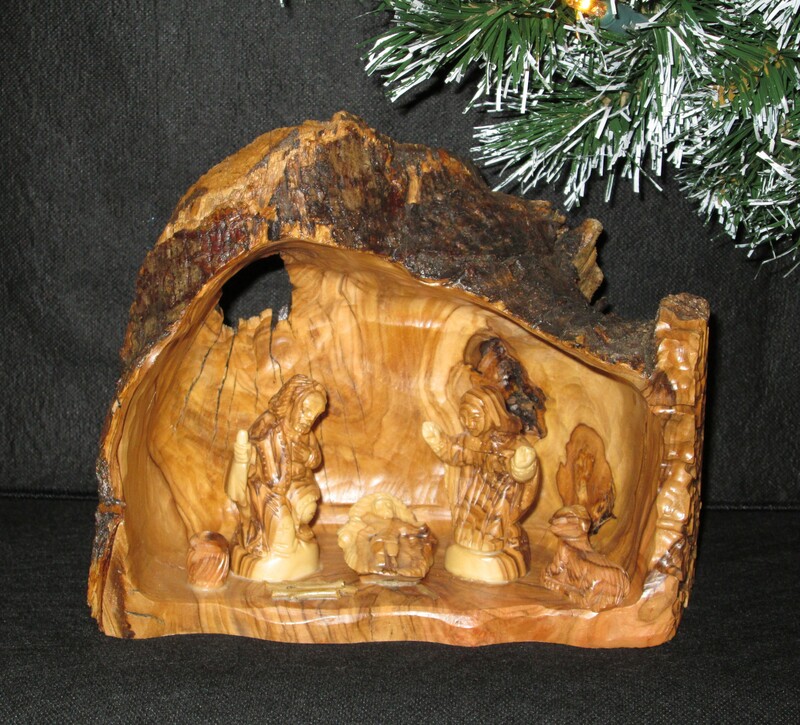 The believers carve intricate nativity scenes out of olive wood and other souvenirs. I treasure the one I purchased that portrays Mary and Joseph gazing at the Christ child in the cave. The typical manger was made of stone, unlike the wooden ones usually portrayed in America. My olive wood nativity scene carved by Christians in Bethlehem. As I recall my days in Labor and Delivery helping those babies into the world on Christmas morning in 1981, I couldn’t help but wonder if anyone assisted Mary during her labor other than Joseph. Luke 2:7 says, And she brought forth her first-born Son, and wrapped Him in swaddling clothes, and laid Him in a manger. (KJV) Typically the midwife or nurse would assist the mother and wrap the baby. Midwives are mentioned in Exodus 1:15-22 who feared God and preserved the Hebrew male babies from Pharaoh’s wrath. I do not think God gave any details about Mary’s labor or delivery because He wanted all the emphasis upon Jesus Christ, the Savior of the world. 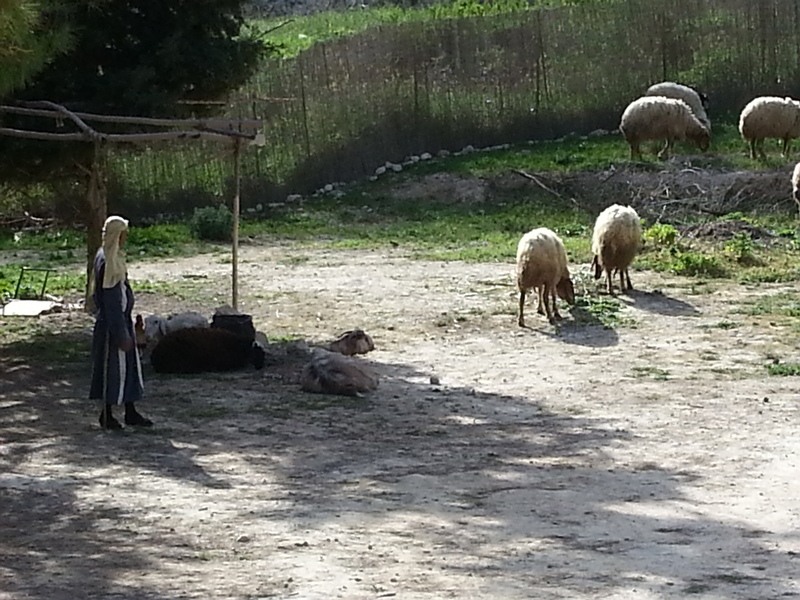 The common shepherds were the first ones who learned of the Savior’s birth and came to worship Him, their Creator. Emmanuel, God with us, who left heaven above, and came to earth to be our Savior. Born to die. Thank You, Lord Jesus, that You love me so much. Charles Wesley captured this thought beautifully when he wrote this well-known carol.